The following details show how to control a MotorBee using a program written in Python running under the Raspbian operating system on a Raspberry Pi model B single board Computer. The Raspberry Pi has two standard USB sockets. One of them is usually dedicated to the keyboard (or keyboard and mouse where a small USB hub has been used). It is assumed the MotorBee is connected via a standard USB lead to one of these ports or to a free USB port on a hub if one is connected. The following simple example of Python Code is all that is required to turn on motor1, set it to half speed, set the servo to centre position, set the digital outputs and read the digital inputs on the MotorBee. Have a look at this code and then see the explanation that follows for detailed description of each of the lines. This uses one of the PyUSB functions to "find" the attached MotorBee. The way it finds the MotorBee is by checking all available USB ports to find the one with a device that has the unique identifier associated with the MotorBee. This identifier is made up to two parts: the Vendor ID and the Product ID. For the MotorBee this is the two hexadecimal numbers 0x04d8 and 0x005b respectively. If the device is found, the "dev" object is created for the MotorBee and can then be used for susequent operations on the MotorBee. It is only necessary to use this statement once in your program, but obviously, it needs to be before any other use of the "dev" functions. It is always good programming practice to check if the MotorBee has actually been found before continuing. This "if" statement will "raise" an exception and halt the program if it is not. The function dev.detach_kernel_driver(0) gets round a possible problem with the operating system restricting the use of the MotorBee. When the MotorBee is first plugged into the USB port the operating system tries to be helpful and associates one of its standard drivers to deal with all operations to the board. We don't want this, but, with it "attached" to the MotorBee it won't then allow any other direct operations. This line "detaches" this driver from the MotorBee allowing us to access it directly. Note that this only needs to be done the first time the program is run after connecting the MotorBee (or after reboot). If you try and detach the driver when it is already detached the program will raise an exception and halt the program. I have found the best way to deal with this is simply to put the detach function at the head of the program inside a "try... except" clause. In this way it will detach the driver if necessary and ignore it if already detached. USB devices have different "configurations" that they can be set to depending on the task they are required to perform. In the case of the MotorBee, it simply has one configuration which is it's default. However, this still needs to be "set" as the active one using the statement shown. This only needs to done once in your program and before any other code that communicates with the MotorBee. The "speed" variables hold the speed of each motor output (motor 1 to 4). The speed is in the range 1 to 255. Note that a speed of 0 is not allowed: To turn off the motor, you should use the on/off controls (described later). Note that in bi-directional configuration one of the pair of motor outputs MUST be set to 0, otherwise the motor will be trying to drive in both directions at the same time and will probably just stall or overheat. The "motoronoff" variable uses the four least significant bits to turn the corresponding motor on or off (regardless of its speed). The bits associated with these outputs are shown below. Please note that the unused bits (bit4 - bit7) MUST be set to logic '1' as shown. A logic '1' corresponds to the associated motor being ON and logic '0' for OFF. The "enable" variable is not used but is reserved for future releases of the board firmware. For now, it should simply be set to 0x30 to ensure the board is fully enabled. The value of the "servo" variable specifies the position that the servo should go to and is in the range 1 to 255. Note: it depends on the servo used how this corresponds to the actual range of movement. Typically, the centre position is specified with a value of 128, -90degrees with 64 and +90 degrees with 192 . Once the data sequence has been specified it is simply sent to the MotorBee using the "write" function within the "dev" object as shown. The number '2' used, is just the name of the internal buffer to use within the MotorBee, or , as previously mentioned, the USB "endpoint" number. For the MotorBee this is always set to 2. The MotorBee motor speeds, directions and servo position will now be set accordingly. In the above description its worth noting that the first few lines may look slightly complicated but, once your program has "found" the MotorBee, detached the kernel driver (if necessary) and set the MotorBee configuration, the control of the MotorBee motors and servo is simply a case of using the "dev.write" function (with the appropriate data in the data array) as often as you like. This is not really required, but shows a convenient way of displaying the data returned (i.e. the current digital inputs) in your program while testing. 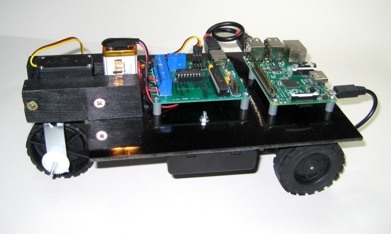 Making a fully automatic intelligent robot/mobile using a Raspberry Pi and a Motorbee.